August 8, 2011 Angela G.
My husband likes most all that I cook for him – in fact, the only thing that got a resounding thumbs down were my Cold Peanut Noodles – I still say it’s not the noodles so much as his distaste for cold pasta, but that’s another story for another day. But because of his regular approval, I live for those dishes that mean adoration spelled across his face in a smile – the ones that get a “This is REALLY good, baby!” instead of a mere “It’s good.” The bites that make him look up immediately, eyes creased with a smile, the satisfaction emanating in a grin and nod. They don’t tell you when you get married that you become hypersensitive to context clues, but alas, here I am, reading facial expressions like ancient runes, sussing out the inside scoop. This recipe, inspired by a similar dish we shared at a mom and pop joint in Long Island, won the coveted gold seal of approval from the hubby with first bite. I had to chuckle because although I was proud of a good dish coming together under my auspice, it was one of the simplest dishes I’ve ever prepared. Don’t worry, I’ll still take the credit for the glory. This recipe doubles and triples exceedingly well, so plan for 1/2 lb. of clams per person for an appetizer, or a full pound for a light entree. In a large skillet, melt the butter over high heat. Add the chorizo and garli and cook until fragrant, about 30 seconds. Add the wine and let simmer until it reduces by 1/3 and chorizo softens, about 2 minutes. Add the clams to the pan, making sure that all are touching the bottom of the pan. Pop a lid on top and cook until clams open up – about 5 minutes. This is kind of fun to watch with a glass lid – all of a sudden the clams will just spring open and take in all that garlicky sauce, just like magic. 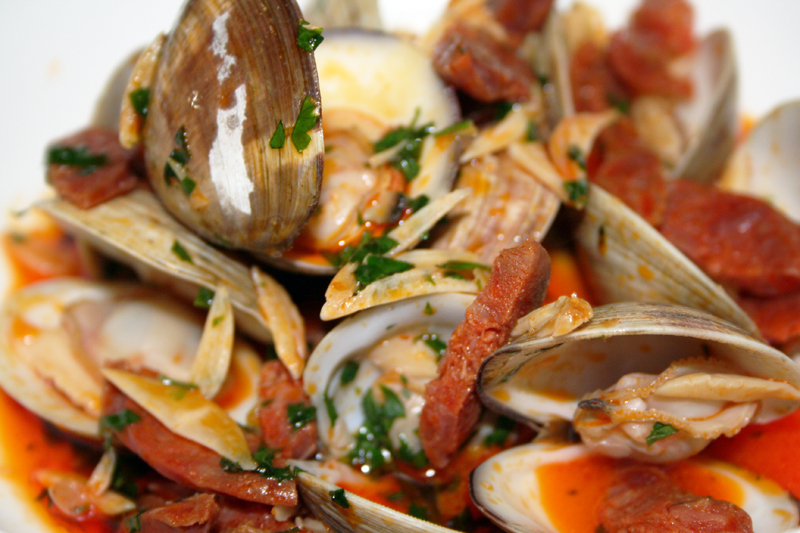 When the clams have opened, sprinkle the parsley over the top and turn off the heat. Pour the entire contents of the pan into a shallow serving dish and serve with plenty of crusty bread. Watch your guests’ faces for signs of exuberant approval.